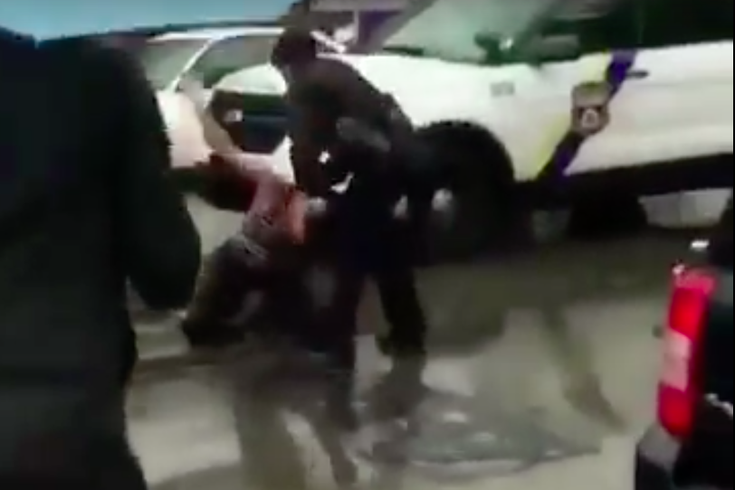 During a Monday brawl in Southwest Philadelphia that was captured on video, a police officer is shown throwing a 16-year-old female to the ground. A 16-year-old girl who was struck by a Philadelphia police officer on Monday will not face criminal charges for her role in the incident, the District Attorney's Office announced. A video posted to Facebook showed portions of a confrontation between the officer and the teen, identified as Johnnae Pendleton, who police say admitted that she threw punches during the incident. Police announced earlier on Tuesday that the Internal Affairs Bureau had launched an investigation into the incident, including the officer's use of force. The police officer has not been publicly identified. After a review of evidence, the D.A. 's office declined to issue any charges against Pendleton, spokesman Cameron Kline said. He declined to say whether the D.A. 's Office was investigating the officer. Pendleton, of Southwest Philadelphia, told 6ABC that she had been trying to help her friend's mother, who was being detained by police, when the officer began pushing her. "I am happy that it was caught on video because if it wasn't I would have been charged and I would've been in a youth study center or something, Pendleton said." Police said officers observed about 30 people fighting when they responded to a radio broadcast for a "person with a weapon" on the 1300 block of South 54th Street around 2:45 p.m. on Monday. The video shows a female police officer entering the fray. She is later shown pushing Pendleton, who responded by grabbing the officer's arm. The video then shows the officer tossing Pendleton to the ground and throwing 10 punches in the direction of her head. It is unclear how many of those punches connected. But both Pendleton and the officer told investigators that they each threw punches, striking one another while on the ground. Pendleton — in the presence of her guardian — told investigators she attempted to interfere with officers as they tried to arrest one of the individuals engaged in the fighting, police said. At that time, a female officer gave several verbal commands to the girl and pushed her away from the scene, but Pendleton continued arguing. Pendleton told investigators that she then slapped the officer's hands and told her to get off of her before striking the officer in the face, breaking her glasses, police said. A struggle ensued and the officer grabbed Pendleton by her hair, taking her to the ground, where punches were exchanged. Pendleton was brought under control with the assistance of other responding officers, police said. She complained of neck pain and was transported to Children's Hospital of Philadelphia. The officer sustained abrasions to her right knee and bruises on her right eye and cheek, but did not go to the hospital. CORRECTION (Jan. 4, 2016): An earlier version of this story incorrectly stated that the D.A. 's Office had declined to charge the police officer.